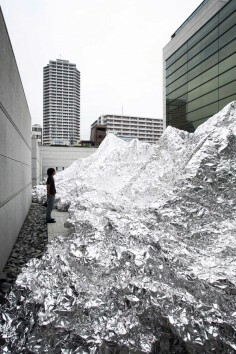 Japanese architect Kimihiko Okada has created Aluminium Landscape, a 6.5 metre high installation made of aluminium foil. Supported by an internal steel structure and covering an area of 902 square metres, the project is currently on show outside the Museum of Contemporary Art in Tokyo, Japan. The following is from the Museum of Contemporary Art, Tokyo: Through Bloomberg’s sponsorship, Museum of Contemporary Art Tokyo is undertaking a project in which young artists from Japan and abroad display works in spaces other than the Museum’s galleries. This year, in the Museum’s “Sunken Garden” outdoor court, Kimihiko Okada will establish an aluminum artwork 22m x 41m x 6.5m in size, thereby producing scenery that alters in appearance along with time’s passage and the changing weather. Kimihiko Okada experiments to change the ways people perceive space with the materials he uses in his art works aside from his work as an architect. His artwork, this time, is displayed in an outdoor space that is open to all and can be viewed anytime, free of charge, even by the casual passer-by. You are encouraged to visit several times and enjoy a work that changes under the influences of its environment. In a broad space outdoors at MOT, I will employ the natural and artificial in producing new scenery. My creation will reflect rain, wind, and other weather phenomena, as well as the movement of the sun, color of the sky, and other quiet changes in the environment. By reflecting the surfaces and shapes of the landscape, the artwork amplifies and transforms nature and makes it visual. It is an artificial structure with a complex and ambiguous geometry, and the object employs a thin, integrated metal membrane in covering a broad area. This scenery will unfold in the Sunken Garden, two floors below ground. Visitors will be able to walk around the display to experience it, or else, for a completely different experience, engendering different meaning, they can look down on its overall figure from the entrance lobby and Public Plaza.